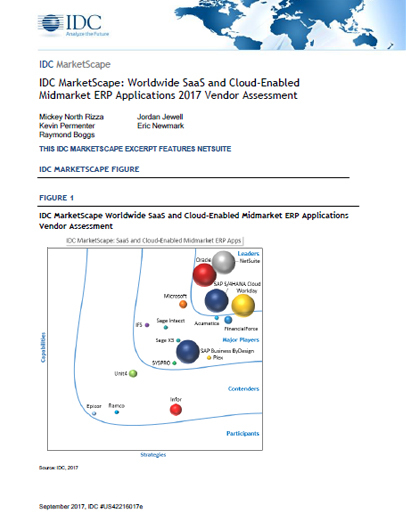 NetSuite has been named a Leader in the IDC MarketScape: Worldwide SaaS and Cloud-Enabled Midmarket ERP Applications 2017 Vendor Assessment. NetSuite, a pioneer in cloud computing and the first cloud ERP company, now helps more than 40,000 companies, organizations, and subsidiaries in more than 100 countries transform their business operations and run their mission-critical business processes in the cloud. The IDC assessment was based on an evaluation of 14 of the leading SaaS and cloud-enabled vendors in the market and based on a wide range of criteria, which include: functionality, user interface, ease of use and implementation, scalability, language support, pricing model, financial stability and innovation and investment, among others. Read an excerpt from the report to see what IDC has to say about us. Learn about IDC vendor inclusion criteria, advice for technology buyers, NetSuite analysis and more. Yes, I would like to receive information from NetSuite including educational webinars and analyst reports.